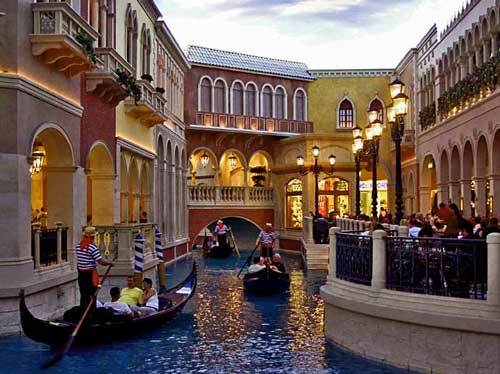 Located on the world-famous Las Vegas Strip and approximately four miles from McCarran Airport, The Venetian triumphs in recreating the glory of Venice. There is so much to do and see and it’s all within walking distance. With such a spectacular setting, it’s clear from the minute you arrive that this is an all-suite, five-diamond resort destination with something extra. Suites start at 650 square feet, nearly twice the size as a typical Las Vegas hotel room. The Palazzo is steps away and offers guests more amenities and features to enjoy. Faithful replications of the Doge’s Palace, the Bridge of Sighs, the Campanile Tower, and St. Mark’s Square offer awe-inspiring sights and sounds true to the crown jewel of Europe. Don’t miss the quarter-mile Grand Canal set in a frescoed sunset sky where gondoliers serenade their passengers on the romantic ride of a lifetime. Features such as the 134,000-square-foot Canyon Ranch SpaClub, the more than 80 international boutiques of The Grand Canal Shoppes, an opulent casino featuring all your table and slot games, a five-acre pool deck, menus created by celebrity chefs including Emeril Lagasse, Wolfgang Puck, David Burke, Thomas Keller, and Mario Batali, and the entertainment of Blue Man Group, Phantom the Las Vegas Spectacular, and Wayne Brady guarantee every visit to The Venetian will be unforgettable. There is a daily resort fee of $15 plus tax that will be charged upon check-in. Resort fee includes daily newspaper, unlimited local calls, high-speed Internet, and access to the Canyon Ranch SpaClub fitness facility. Rates displayed reflect the lowest rate found over the next 30 days. This rate is subject to change. Rates may not include service charges, extra person charges, fees or incidental charges (such as room service). Converted rates (shown in parentheses) are provided for your convenience. They are based on today’s exchange rate, but the hotel will charge you in the local currency. The amenities and/or facilities may not be located at this hotel, but within a reasonable distance and additional charges may apply for use. All information has been provided by this hotel.